Pulmonary arteriovenous malformations (PAVMs) are structurally abnormal vessels that provide direct capillary-free communications between the pulmonary and systemic circulations, and hence, right-to-left shunts . Due to impaired gas exchange, hypoxaemia is common but exercise tolerance is usually preserved through haematological (erythrocytotic) and cardiovascular compensations [2, 3], and patients are frequently asymptomatic [1–3]. Treatment of PAVMs is recommended to prevent paradoxical embolic sequelae such as ischaemic strokes  and brain abscess , commonly improves migraine headaches , and is a successful emergency treatment for haemorrhage. The majority of patients with PAVMs have underlying hereditary haemorrhagic telangiectasia (HHT). This inherited vascular condition results in nasal and gastrointestinal telangiectasia and systemic arteriovenous malformations (AVMs), for example, in hepatic and cerebral circulations. HHT-affected individuals usually experience recurrent nosebleeds (epistaxis), and high proportions have iron deficiency anaemia due to under-replacement of haemorrhagic iron losses . Iron deficiency has been identified as a risk factor for venous thromboemboli (VTE) in HHT patients  and for ischaemic stroke in HHT patients with PAVMs . Since nosebleeds are the usual cause of iron deficiency anaemia in HHT , these nonrespiratory conditions represent important components to address in the full management of patients with PAVMs . At our institution, patients undergoing treatment for PAVMs are routinely followed up ∼6 months after embolisation, when PAVM sacs have usually regressed (see images in the supplementary material of the article by Howard et al. ). By 6 months, compensatory polycythaemia  and higher cardiac outputs  have also reversed, and this is a useful time-point to assess sustained clinical responses to embolisation. A standard “Have you noticed any difference?” question is asked, intended to capture respiratory [2, 3] and neurological [4, 6, 10] symptoms. Surprisingly, both spontaneously and in response to this question, patients frequently reported that their nosebleeds had improved following this apparently unconnected treatment. To examine further in a clearly objective and unbiased manner, relevant questions were designed for inclusion in a wider HHT survey that did not specify specific study aims. The NRES Committee East Midlands-Derby 1 Research Ethics Committee approved the study and online launch at https://www1.imperial.ac.uk/nhli/cardio/vascular/pulmonary_vascular/hht_pavms/hhtsurvey/ The basic study design has been reported previously . Briefly, online informed consent was obtained from all participants who were then asked to provide details on general aspects of their HHT phenotype, before proceeding to a series of questions regarding nosebleed responses to assessments and interventions. For participants reporting that they had received a particular treatment or investigation, they were directed to a further question with tick box options for “Following [intervention/assessment] nosebleeds were…‘no different really’; ‘seemed a bit better’; ‘seemed a bit worse’”. The survey recruited from August 2013 to April 2015. At study closure, 706 individuals had completed the survey. 167 individuals (43 men and 124 women, mean age 52 years) reported treatment of PAVMs. The majority had been treated by embolisation (160, 95.8%), although 20 (12.0%) reported surgical treatments (13 had received both types of treatment). As a group, the 167 reported multiple other manifestations of HHT including nosebleeds (154, 92.2%), mouth telangiectasia (145, 86.8%), finger pad telangiectasia (86, 51.5%), cerebral AVMs (27, 16.2%), hepatic AVMs (17, 10.2%) and/or gastrointestinal HHT (13, 7.8%). Nosebleeds were frequent: 121 (72.5%) out of 167 reported nosebleeds at least once per week and 64 (38.3%) reported nosebleeds at least once per day. 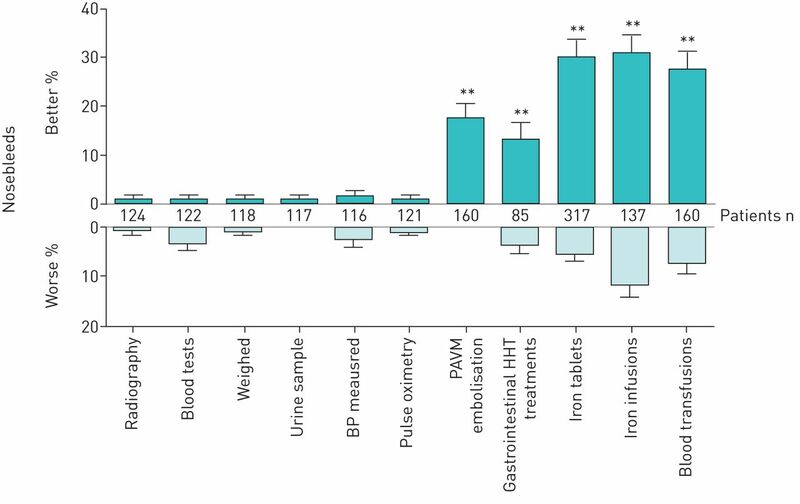 Unsurprisingly in view of these haemorrhagic iron losses , 104 (62.3%) out of 167 had used iron tablets, 40 (24%) out of 167 had received at least one iron infusion and 41 (24.6%) out of 167 had received blood transfusions, including 13 (7.8%) who had been transfused on at least five different occasions. 28 of the 160 patients who had embolisation treatment for PAVMs (17.5%) reported that their nosebleeds seemed better after PAVM embolisation (figure 1), compared to three (1.8%) out of 160 reporting nosebleeds were worse after the treatment (Chi-squared p<0.0001). Of the 20 whose PAVMs were treated surgically, there was one report of surgery leading to nosebleed improvement and one report of nosebleeds becoming worse after surgery. Reported effects of investigations and treatments on hereditary haemorrhagic telangiectasia (HHT) nosebleeds. Note that treatments reported by small numbers of patients are not represented graphically. BP: blood pressure; PAVM: pulmonary arteriovenous malformation. **: p<0.01 calculated by Chi-squared compared to BP measurements (gastrointestinal p=0.0032, all other p-values <0.0001). To provide control assessments, the same nosebleed questions were asked for a series of investigations where no difference in nosebleeds was expected (giving a urine sample, pulse oximetry, getting weighed, blood pressure measurement, blood tests and standard radiography (figure 1)). Within the PAVM treatment cohort, nosebleed improvements were most commonly reported following blood pressure measurements (three (2.5%) out of 121 cases) but this proportion was significantly lower than that reported for improvement following PAVM embolisation (Chi-squared p<0.0001). There was no difference in the proportions reporting nosebleed exacerbation after PAVM embolisation, compared to after a simple radiography, urine sample, getting weighed or pulse oximetry (0–1 reports), blood pressure measurement (three (2.5%) out of 121) or a blood test (four (3.3%) out of 122) (all Chi-squared p>0.47). Our interim conclusion was that PAVM embolisation may improve HHT nosebleeds in a substantial minority of cases. The survey did not allow capture of how long any improvement was sustained, although our original and subsequent clinical observations suggested this was maintained for at least 6 months. Multiple pathophysiological variables correct or improve following PAVM embolisation, including gas exchange and capillary bed filtration/processing [1, 4]. In addition, previous haematological and cardiovascular adaptations required to maintain arterial oxygen content and oxygen pulse (oxygen delivered per heart beat) are lost [1–3, 5, 9]. In isolation, therefore, it would be difficult to speculate which, if any of these, may be causally related to nosebleed improvements. However, improvements in nosebleeds were also commonly reported following treatments for diverse aspects of HHT such as anaemia and systemic AVMs: different subgroups of the surveyed population had undergone each of these treatments so direct statistical comparisons were not fully valid, but as for the treated PAVM subgroup, only very low numbers reported nosebleed improvements after noninvasive assessments such as chest radiography, pulse oximetry and blood tests. In contrast, nosebleed improvement was commonly reported following treatment of gastrointestinal tract HHT (11 (12.9%) out of 85), cerebral AVMs (five (8.9%) out of 56) and hepatic AVMs (five (45%) out of 11). Similarly, high proportions of HHT sufferers reported nosebleed improvements following iron tablets (49 (15.5%) out of 317), iron infusions (42 (30.7%) out of 137) and/or blood transfusions (44 (27.5%) out of 160) to treat anaemia (figure 1). Due to limitations of the survey methodology, we could not rule out unintended bias or failure to capture concomitant additional nosebleed treatments, although neither would account for our original observations within our own PAVM series. Since the shared common feature of all systemic AVMs, PAVMs and iron deficiency anaemia is a higher cardiac output that reduces after AVM/anaemia treatment [9, 11–13], we suspect this may underlie the reported improvements, particularly for larger AVMs. Potential flow, vasodilatory and other mechanisms deserve evaluation in further studies, which could employ the validated epistaxis severity scoring system , explore whether particular subgroups are more likely to report epistaxis improvement following PAVM embolisation and evaluate whether epistaxis treatment requirements reduce following PAVM embolisation. The repeated and varied epistaxis treatments required by high proportions of people with HHT emphasise the potential importance of the current observations. For example, in one unselected, international HHT population reported recently , 326 (49%) out of 663 had required specialist interventional treatments for HHT nosebleeds, including cauterisation (267 (40%) out of 663), laser photocoagulation (221 (33%) out of 663) or both (173 (26%) out of 663), and commonly, additional measures such as emergency packing (163 (25%) out of 663), septal dermoplasty (84 (13%) out of 663), embolisation (47 (7%) out of 663), Young's procedure (nostril closure) (19 (3%) out of 663), arterial ligation (19 (3%) out of 663), and/or medical therapies including antioestrogens, aminocaproic acid, tranexamic acid or bevacizumab (Avastin). Finally, although PAVM treatments were only rarely reported to worsen nosebleeds, nosebleed exacerbations were quite commonly reported following cerebral AVM surgery (three (21.4%) out of 14) and anaemia treatments; as in a separate HHT population , nosebleeds were reported to worsen after the treatments by 18 (5.7%) out of 317 iron tablet users, 16 (11.7%) out of 137 iron infusion users and 12 (7.5%) out of 160 receiving blood transfusions. The common arterial origins of nasal and intracerebral arteries, and recent demonstration of endothelial damage by relatively low concentrations of iron , may provide plausible explanations that would be unlikely to apply following PAVM embolisation. In conclusion, PAVM embolisation appears to result in improvements in HHT nosebleed severity for one in 5.7 (95% CI 4.3–8.7) people. HHT nosebleed improvements are also reported following diverse treatments for systemic AVMs and anaemia in HHT. Support statement: This study received support from donations from families and friends of hereditary haemorrhagic telangiectasia patients, and National Heart and Lung Institute BSc Project funds (to C.L. Shovlin for T. Patel). Dr Shovlin also acknowledges support from the National Institute for Health Research Biomedical Research Centre Funding Scheme (Imperial BRC). The study sponsors played no part in study design, in the collection, analysis or interpretation of data, in the writing of the report, or in the decision to submit the paper for publication. Funding information for this article has been deposited with FundRef.
. Pulmonary arteriovenous malformations. Am J Respir Crit Care Med 2014; 190: 1217–1228. Arterial oxygen content is precisely maintained by graded erythrocytotic responses in settings of high/normal serum iron levels, and predicts exercise capacity: an observational study of hypoxaemic patients with pulmonary arteriovenous malformations. PLoS One 2014; 9: e90777. Cardiopulmonary exercise testing demonstrates maintenance of exercise capacity in hypoxemic patients with pulmonary arteriovenous malformations. Chest 2014; 146: 709–718. Ischaemic strokes in patients with pulmonary arteriovenous malformations and hereditary hemorrhagic telangiectasia: associations with iron deficiency and platelets. PLoS One 2014; 9: e88812. Cerebral abscesses among Danish patients with hereditary haemorrhagic telangiectasia. Acta Neurol Scand 2014; 129: 192–197. Embolization of pulmonary arteriovenous malformations and decrease in prevalence of migraine. Neurology 2006; 66: 202–205. Hemorrhage-adjusted iron requirements, hematinics and hepcidin define hereditary hemorrhagic telangiectasia as a model of hemorrhagic iron deficiency. PLoS One 2013; 8: e76516. Low serum iron levels are associated with elevated plasma levels of coagulation factor VIII and pulmonary emboli/deep venous thromboses in replicate cohorts of patients with hereditary hemorrhagic telangiectasia. Thorax 2012; 67: 328–333. Direct haemodynamic effects of pulmonary arteriovenous malformation embolisation. Neth Heart J 2014; 22: 328–333.
. Relationships between epistaxis, migraines, and triggers in hereditary hemorrhagic telangiectasia. Laryngoscope 2014; 124: 1521–1528.
. Circulatory contributors to the phenotype in hereditary hemorrhagic telangiectasia. Front Genet 2015; 6: 101. Physiologic aspects of anaemia. Crit Care Clin 2004; 20: 187–212. Long-term outcome of patients with hereditary hemorrhagic telangiectasia and severe hepatic involvement after orthotopic liver transplantation: a single-center study. Liver Transpl 2010; 16: 340–347. An epistaxis severity score for hereditary hemorrhagic telangiectasia. Laryngoscope 2010; 120: 838–843. Lifestyle and dietary influences on nosebleed severity in hereditary hemorrhagic telangiectasia. Laryngoscope 2013; 123: 1092–1099. Can iron treatments aggravate epistaxis in some patients with hereditary hemorrhagic telangiectasia? Laryngoscope 2016 [in press DOI: 10.1002/lary.25959]. Low dose iron treatments induce a DNA damage response in human endothelial cells within minutes. PLoS One 2016; 11: e0147990.